Check out satellite before/after images of the capital city of Nepal: Photos: Nepal Earthquake, before and after in satellite photos – Denver Post. The images come from DigitalGlobe, which is giving relief groups free access to images of Nepal: DigitalGlobe opens access to satellite data to support disaster response efforts in Nepal – DigitalGlobe. Planet Labs is also offering its images: Responding to the Nepal Earthquake – Planet Labs. A typical satellite image in Google map view might be two or three years old. This Google Crisis Map shows where new imagery is available for Nepal. You can then zoom in on a particular area in the new images. 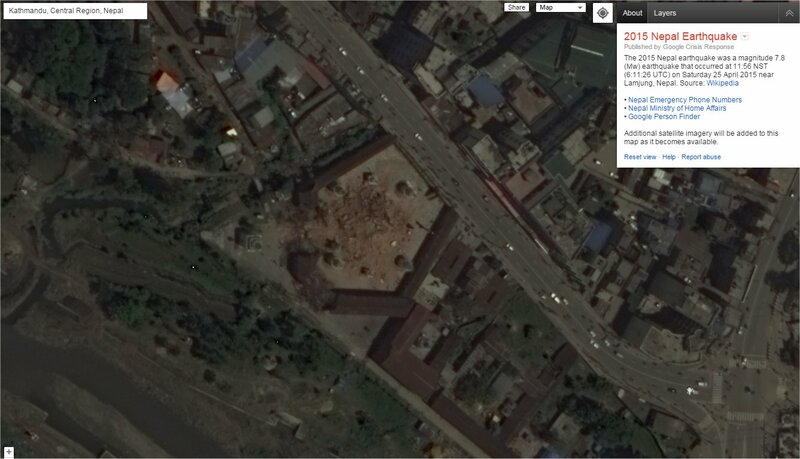 Screen capture of an area in Kathmandu from Google Crisis Map. Here’s an article about the broader role that satellites are playing in the recovery, particularly regarding communications services: Satellite Industry Responds to Nepalese Earthquake – Via Satellite.